Size of Male: 60-70 lbs., 28-30 in. Size of Female: 60-70 lbs., 27-28 in. The Greyhound dog is the fastest of all dogs, at least over short distances. They can reach speeds around 40 mph. Yet it’s their personalities that have won these dogs so many fans. The elegant Greyhound dog makes a sweet and loving companion in the home. They are affectionate toward families members, get along well with other pets, and are surprisingly laid back in the house. However, they do need plenty of daily exercise. There has been much speculation that the Greyhound derives from ancient Egyptian sources since dogs of similar type have been found depicted in Egyptian artwork. However, DNA evidence suggests that this dog breed originated with the ancient Celtic tribes from eastern Europe and Eurasia and were later enjoyed by Romans and Greeks. Sighthounds of this type have been popular in Europe for centuries, but modern breed descend from dogs that were first registered in the 18th and 19th century kennel club studbooks. Today, there are two sources for this breed: those from registered kennel clubs, such as the American Kennel Club; and those bred for racing. 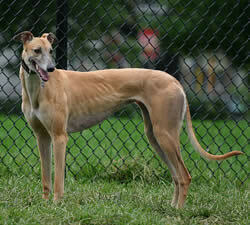 The latter dogs are usually registered with the National Greyhound Association in the U.S. Many people obtain these dogs once they are retired from racing. The Greyhound is a sweet and loving dog, gentle and devoted to their family. They tend to be easy going at home and don’t exert themselves more than necessary, at least in the home. They do require plenty of exercise on a daily basis. They are not couch potatoes all the time. Although they usually get along well with other pets in the home, you should be careful of them around cats and other small pets until you know they won’t chase them. Be careful when walking these dogs since they may feel the urge to chase small animals. Do not exercise them off-leash unless you are in a very safe and secure area since they will give chase. Greyhound dogs typically love children and are very gentle with them. They don’t mind strangers and probably won’t bark much. This dog breed is intelligent and dog training can be easy, though they may display a streak of independence at times or pretend not to hear you. Living Environment – The Greyhound dog can adapt to living in an apartment since they are usually very calm and relaxed in the home. However, they do need plenty of daily exercise. These dogs make good jogging buddies and they enjoy trotting with you while you bike. They don’t have an undercoat and they are susceptible to temperature extremes so they should never be housed outdoors. Grooming – Grooming requirements for this short-haired breed is minimal. They have a short, dense coat that should be brushed regularly to prevent excess shedding. Bathe as necessary. Diet & Exercise – Dietary requirements for these dogs is considered normal. However, they can be prone to putting on weight if they don’t get enough exercise. Make sure these dogs get plenty of daily exercise for their physical and mental fitness. Otherwise, you will have a flabby, unhappy dog in your home. Health – Like many sighthounds, this breed is susceptible to some insecticides, so you should talk to your veterinarian about which flea and tick products will be safe to use on your dog. These dogs are also sensitive to anesthesia, which veterinarians should know. Otherwise, this is usually a healthy breed. Some dogs may experience esophageal achalasia or osteosarcoma. Bloat is also a problem in the breed. If you are interested in this dog breed you should talk to a breeder about possible dog health problems. In the dog training arena, Greyhound dogs are intelligent and they have a desire to please their owners. They are also very gentle and sensitive dogs. These dogs learn very well by using positive dog training techniques (praise, rewards). These dogs can excel at obedience, rally, agility and other dog activities. Most are also very enthusiastic if you allow them to participate in the sport of lure coursing, which is a modern version of coursing. No animals are used or harmed in lure coursing but Greyhound dogs and other sighthounds have a chance to exercise their instincts in the field by chasing a mechanical lure. The dogs have great fun.